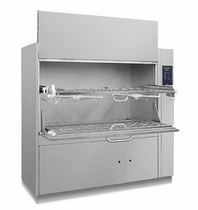 Aquatic Washer equipment cleans and disinfects all types of feeding bottles, animal cages and fish tanks. 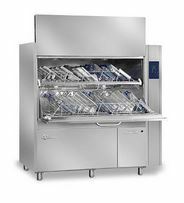 This equipment assures outstanding washing and sanitization results. Final rinse temperature is guaranteed to reach 85°C/185°F thanks to an independent rinsing circuit. – Drop down / vertical sliding loading door. Pass-through configuration available for AC 1400 and AC 1200. – Chamber and doors entirely made of stainless steel AISI 316L, external body made of stainless steel AISI 304. – Rotating spray arms positioned on the top, middle and bottom levels of the washing chamber. – Multi stage filtering system. – Self-cleaning filter for the recirculation of the washing water. – Washing pump pressure switch. 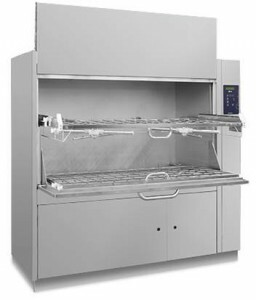 – Disinfection by rinsing at 85°C/185°F. – Tank and sump temperature check. – Equipped with 1 chemical dosing pump as standard, controlled by a micro-processor which allows to set the optimal dosing level for each type of cycle. – The detergent tank level is monitored and is fitted with a low level alarm. – RS 232 port for printer connection.